THE APPETITE FOR PENNY STOCKSstocks that trade for less than $5 a shareis greater than it's ever been. Due to their potential for rapid change, these investments can be both lucrative and high-risk. Penny stocks that pass the proper analysis can quickly multiply in value, dramatically outperforming every other type of stock, including so-called "safe" blue chips. Exciting, original, and inspiring, Invest in Penny Stocks is the only book of its kind. The Penny Stock Professional, Peter Leeds introduces you to all the concepts needed to become a successful penny stock investor: risk-free paper trading, tactics of the pros, the best markets, effective due diligence, and much more. He also reveals his 29- point Leeds Analysis, which uncovers the absolute best small companies with strong management teams, great upside potential, proven revenues, patented technologies, and rock-solid fundamentals. These premium penny stocks are more likely to outperform, and less likely to suffer downside price moves. Packed with nearly twenty of Leeds' favorite trading tactics and over forty real company trading charts, Invest in Penny Stocks can quickly help anyone become a successful trader. Using methods of fundamental and technical analysis developed over many years, Peter Leeds is consistently able to discover value in companies that others can't see. With Invest in Penny Stocks, he shows you how to take advantage of the opportunities that everyone else is missing. 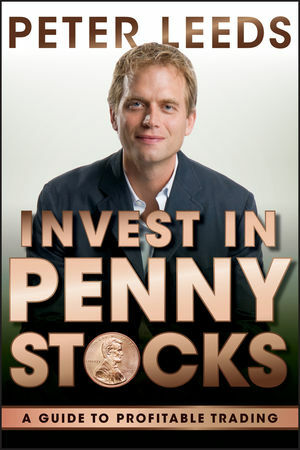 PETER LEEDS is The Penny Stock Professional, the most widely recognized personality associated with low-priced stocks. Along with the help of his team, he publishes Peter Leeds Penny Stocks, an online service that has sold 35,000 subscriptions, making it one of the most popular financial newsletters in North America. He frequently appears on main stream media, including NBC, CBS, CNN, Fox Business, and in dozens of other newspaper, radio, and Internet outlets.